FIFA’s guilty verdict against two of its top officials in the World Cup "cash for votes" scandal isn’t surprising. The case was reportedly so cut and dried that it would have been counter-productive for football's ruling body to be seen to protect its own. What is surprising, however, is that FIFA claims such righteous indignation that this kind of corruption exists within its ranks. Absolute power corrupts absolutely, as they say, and FIFA has managed to carve itself a niche as the ultimate untouchable in the sporting world, even to the extent that it puts its own laws above those of actual governments by forbidding political interference in football matters under pain of expulsion for the guilty member country. Furthermore, under the reign of its current patriarch, Sepp Blatter, FIFA has been as focused on the buck as the ball, mutating from a so-called “family” into a money-making machine. For example, South African traders complained of being forced out at this year's World Cup as FIFA strictly enforced the commercial rights agreement it requires from any host nation. Little wonder then that with a “What’s in it for us?” mentality permeating the brotherhood, a “What’s in it for me?” mentality is just a step away. Theoretically, of course, FIFA is safeguarded against the frailties of human nature by being a democracy, with voting delegates representing the interests of each member nation. However, it appears to work less than perfectly in practice, with a select group calling the shots. For example, how else can you explain a situation whereby, long before December's vote, President Blatter was able to state that the 2018 World Cup is going to Europe. “There is a movement at the moment among the various candidates that in the end it would be a good solution if the candidates for 2018 would only be those from Europe,” he said at a news conference in January. “It's not been finally decided but it's the idea, also to make the work of FIFA easier and especially that of the executive committee." Easier for the executive committee! Aren't they supposed to serve football instead of the other way around? And who are they anyway, besides 24 largely anonymous men (22 now that Nigeria's Amos Adamu and Oceania president Reynald Temarii of Tahiti have been discredited) who’ll decide the destination of not one but two World Cups - the biggest single events in global sport. The fate of the many resides in the hands of the few, thus opening the way for corruption. Why? Because influencing one or two votes among 24 is so much easier and cheaper than trying to have a significant effect on a larger group. And any decisions they make can potentially have more impact, which is why the process has to change. FIFA, especially in regard to World Cup bids, still gives the impression of being an elitist boys' club. And, despite paying lip-service to increased transparency and accountability, there are still too few checks and balances when it comes to making major decisions. Of course, one or two bad apples don’t spoil the whole bunch, but it certainly leaves a bit of a stink in the bottom of the barrel doesn't it? They all a bunch of "maffiosso" ... ignoring the sport itself, fixing games, and always looking for more more money ... way too greedy! So far it is only these 2 individuals who have been caught. What about the member nations who did the deals with these 2 guys, why no sanction against them? For years now i have been saying that FIFA is a self absobed, self important and corrupt entity pandering to the ego of 1 man, Sepp Blatter! Arguably, the presidency of FIFA holds the most power seat in the world outside of major world governments. It is worth 10's of billions, employes and feed hundreds of millions and entertains billions all around the world and yet 24 people vote amongst themselves for everything from who is going to be president to who is going to host the world cup and all the rules in between. How can they not be corrupt? 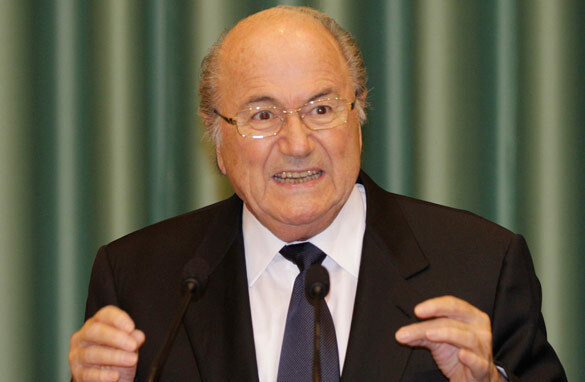 Blatter wants to and will probably continue as the next FIFA president. HOW? most of the football fans in the world share my thoughts that he is a less than righteous and turning into a blithering old man. How could he possibly hold such power for so long. It has turned into the Blatter dictatorship. Football fans all around the world should have a voice. Afterall, without the fans, there would be no football and no FIFA and yet, even with all the billions of pounds we all spend every year, the suffering we go through to even be able to watch a live match and yet, we do not have a say. For example, in any blog or opinion poll relating to the Vuvuzellas in South Africa this summer, the vast and overwhelming majority wanted them banned. Yet Blatter, all on his own cognicense said NO. Why did he say no? sImply because he did not want to upset the African continent and this is because the deals he had put in place form himself! Blatter and his cronies swan around the world in VIP fashion, treated like gods and its all because of our money and our loyalty to the teams and the sport we love. Here is a great example. The Sunday Times broke the story of the corruption scandal and Blatters response was "I think the British media has damaged the chances of England to host 2018". I am not a big fan of British media but surely this was a warning by FIFA for the media all over the world to not investigate FIFA bacause the ramifications for your country will be too severe. He knows with his political and economic connections and the value of hosting world cups is so great that politicians will put pressure on their medias to back off from FIFA. Why would FIFA do this, this only makes them look like they really do have something to hide! We know thay do and they know we know they do, so they have started building a wall. Look, being English you think i would be biast towards England, but seriously, for the 2018 world cup, is there really a better suited host than England. We have the stadiums, the supporters, the infrastructure, the history, the passion and we haven't held it for 44 years. Spain had it 28 years ago and Russia do not have the set up! Blatter has himself said that England could host the tournament tomorrow, and he even approched the English FA in 2009 when there was doubt over South Africas abiltiy to be ready and whether England would be able to step in at the last minute. He didn't ask anyone else bacause no one else could do it at such short notice. Germany could have of course as they still have everytihng in place from 2006 but Blatter knew England could do it. If England do not get 2018 then you really have to ask why? CNN WORLD SPORT does not cover AFCON, why is that? On Wednesday we had European countries playing friendly games and some African countries qualifying games for AFCON 2012, guess what results CNN WORLD SPORT announced...! My suggestion is that all the Nation's FA President around the world be given a voting right via the internet to decide who host the world cup. Since it is called the "world cup", 24 pple are not enough to represent the interest of the whole world and millions of football fans. But why Amos from Nigeria? what a shame. The BRITISH PEOPLE &media must stop acting as if they have a birthright to host the Fifa worldcup just because the English invented the sport.Sepp Blatter will remain the most powerful man in the sporting world whether the right wing Rupert Murdoch & his Sunday Times ,Terry Baddoo&his erstwhile British &American people like it.Dr Joseph Sepp Blatter has continued to transform FIFA into a billion dollar corporation ,his brainchild ,goal projects have transformed lmillions of lives in Africa& Asia.How hypocritical that the americans & british talk of corruption in FIFA as if corruption doesnt exists in their own backyards??? ?.Dr JS Blatter will still retain the FIFA presidency without the votes of the witch-hunting British &Americans.On Dec 2ND the British are going to pay a huge price 4 their arrogance,disdain,racial bigotry,BBC panorama programme &Sunday times witch-hunt & negative FIFA reporting..
@ Tuffy, for your information, The United Kingdom is widely regarded as the most racially tolerant nation in the world. It is a country where all are not only free to practice their religions and beliefs but encouraged. Regarding our alleged birthright to host the world cup, actually, yes we should host it. Mainly because we are the most ready of all nations and Sepp Blatter has even said so. Secondly, If France, Italy, Germany, Mexico and by 2014, Brazil would have all held the tournament twice, so why not England. As for what the wonderful Blatter has done for Asia and Africa, are you kidding me, he didn't do it to help the impoverished, FIFA simply did it to expand their "Brand", power and wealth. FIFA gave the US the World Cup (By their own admittance) to help encourage the growth of football in the US. To think he and FIFA gave Japan and South Africa the world cup for benevelance is nieve beyond belief. As for Rupert Murdoch, you do realise that he is Australian! At no stage did i insinuate that the UK was without flaw or corruption and i don't really care either. What i do care about is that football is the world game for all people around the entire world, it is paid for by the fans through our pockets and hearts, through our hard earned wages and our loalty and passion. To have a body of 24 men, led by Sepp Blatter dictating in a highly secrative organisation and behind closed doors whilst swanning around the world in their privaledge VIP lifestyles is simply not right. To prove my point, why do the fans not have a say in who runs our federation? We do not get to even vote for who is on the FIFA committee. IT is all done internally! What you must realise, in the world we live in, the more high profile a figure you are, the more questions you have to answer. FIFA has never defended any of the players or managers entrapped by the media, or emblazened across the news for legitimate reasons and yet now because someone has dared to show FIFA's internal corruption, they want to stand up against the press. Simply, if FIFA have nothing to hide then they have nothing to fear. It is my belief and the belief of tens of millinos of fans around the world that FIFA and its committee only act for themselves and do so in a self protective, corrupt, self important, privaledged and utoletarian manner. Surely ou can see this. If you want to applaud Blatter and what he has done for Africans, answer me this, where was he in South Africa when 400 stewards who protested after a game about their low wages were moved on at gunpoint b the police! I'm English and go to all England games at home and most of the away games. I was in South Africa for the WC2010 (which was brilliant by the way) following England and I'll be in Brazil in 2014. But I don't want us to host the 2018 WC. Why not? Primarily because we don't need it – in fact it would act against the real interests of most English football fans. We have got a great professional league system which needs no help – and the problems of our National and amateur games would be obscured, not helped, by hosting the World Cup in 2018. Far better to go watch it in Spain/Portugal or even Russia and maybe even take a team there that deserves to win – which of course would mean that we should be focussing now on creating great English players and coaches rather than worrying about winning a dodgy competition to host an event whose profits will not be spent on the grass roots of our game. And is it really important if FIFA is only a little bit sleazy, or institutionally corrupt? What actually matters is that we create a better game in England from top to bottom – and that means starting by looking hard at ourselves. Some posts here are off the mark – keep it to the point of the article. Sepp and FIFA are corrupt and are money hungry. There was a recent article that FIFA commented Australia's bid for 2022 was given a blow because FIFA predicts Aussie world cup would produce the least amount of profit.... WOW.... that says it all and justifies some people's comments and the article. FIFA has lost its way. I think Fifa has very serious cases of corruption problems it has to handle. I think it is great though that Fifa has allowed and made ways for nations who never hosted the world cup, to get a chance to do so. It was great to see a world cup in Asia with the tournament being held in Japan and South Korea in 2002 and seeing it being held in Africa in 2010. There are some things i don't like about Fifa which i wish they would change. The first thing i think they should change would the laws regarding the use of video technology. I think video replay for controversial and critical plays should be allowed to prevent cheating and manipulation of the game from spreading. There is so much controversy caused because of this and i think it is only just that they allow this to be implemented into Fifa's laws. Chip line technology would help also, but i am in favor of video replay especially for controversial goals or penalty kicks. I also believe that they should be willing to have votes renewed to make way for a new president to be in charge of Fifa. I don't think it is just for someone to stay in power for so long in such a powerful organization. Fifa reputation has been hurt with this corruption scandals, along with this mafia image it has build being looked as only a corporation interested in money and profits rather than the game itself. I think the thing that would need change would be these laws preventing technology from entering into the game of football soccer. I would respect Fifa more if they actually listened more to what the fans thought rather than focus their own thoughts and decide between themselves how the rest of the world absorbs their thoughts in the game. The vuvuzelas should have been banned, and i believe they may have even undermined many teams from performing well in the South Africa world cup given the high level noises interfered with the communications of each team competing in the world cup in South Africa. I believe the story could have been different if England was given the right to host the wc in 2018 and USA in 2022. We could have not hearing all these stories at this time. This indicates the sence of selfishness and proudish of your countries (USA & England). You should understand that other countries also deserve to get equal opportunities at list once in a lifetime. England and USA should congratulate Russia and Qatar respectively, thanks to David Bekham he has already done it And; Bravo FIFA for being fair,transparent and democratic to give equal opportunities to all the countries/continents regardles of their capability and status- 2010 was South Africa, 2018 wil be England and 2022 Qatar. fifa must put its house in order or they all ship out. Sepp Blatter has to be the most corrupt/foolish/dum person in any sport right now. He all but said don't vote for England just before the vote and even before the results came out we knew that Russia had won it. He made fun of our(Ireland's appeal) to have the replay against France and after that I have no respect for him.